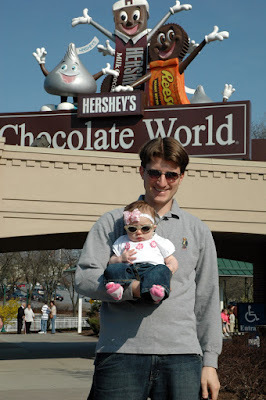 While at the Hershey Outlets, we decided to take Ava over to Hershey's Chocolate World. 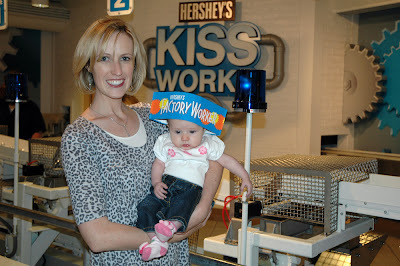 She got to be a factory worker in the Hershey's Kiss Works. Ava was too little to make any Hershey's Kisses, but they gave her a hat anyways. Wearing her new-found possession, Ava posed in front of the giant Reese's Pieces. For those who don't know, Reese's is a subsidiary of Hershey's Chocolates. Hershey's also makes Twizzlers, Kit Kats, Jolly Ranchers and York peppermint patties. Here is Ava on the Chocolate World ride, which teaches children the important life skill of how chocolate is made. Behind her are the Hershey milk cows, from whence the milk comes for making milk chocolate. Although she couldn't tell us she had a fun time, we could tell from all of her intense staring at what was going on around her that she was enjoying herself. 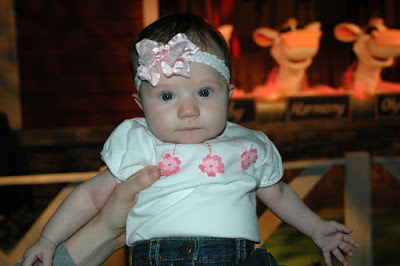 Perhaps in a few years we'll bring her back and take her on the kiddie rides at Hershey Park as well. Granny O said: We live for these darling pictures and comments! What a wonderful surprise to find new pictures this morning. She looks so cute. 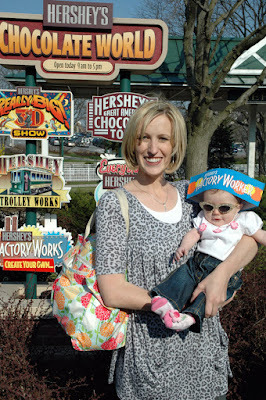 We partiuclarly love the sunglasses and Hershey worker hat. What a fun scrapbooking picture. Life skills, life skills. Larry, you crack me up! Although, I do agree that it is a very important part of life to know about. Amen to that! By the way, Krista looks SO beautiful in these pictures!